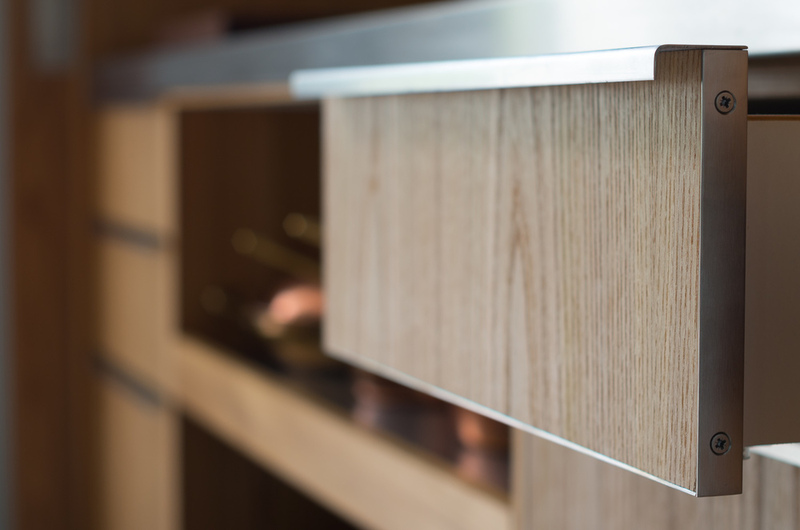 Our brief was to create a beautiful, streamlined kitchen that could stand up to the rigors of daily use and entertaining large parties of guests. As keen cooks our clients have a wide array of kitchen gadgets and utensils that should be on hand when needed, but concealed the rest of the day. 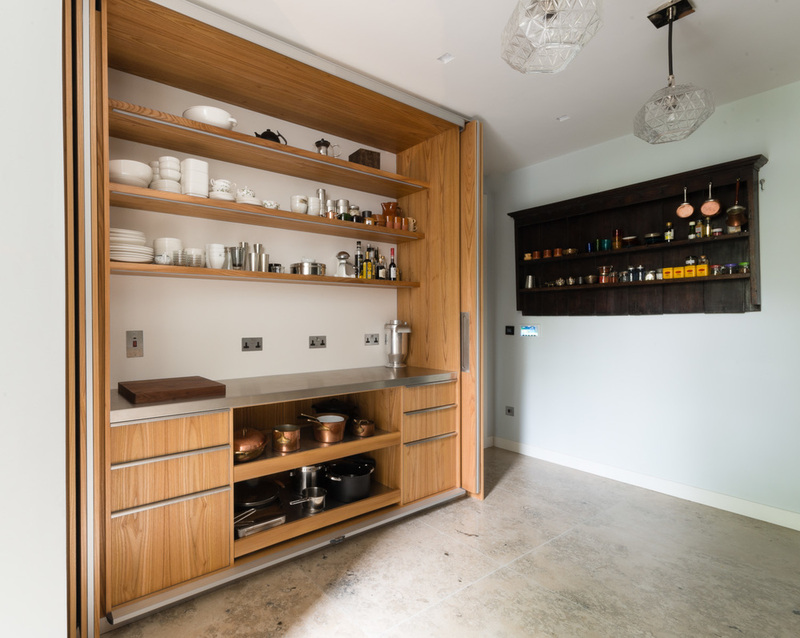 We chose to build a large pantry unit with plenty of storage for all these items which can be hidden away behind a set of folding sliding pocket doors. 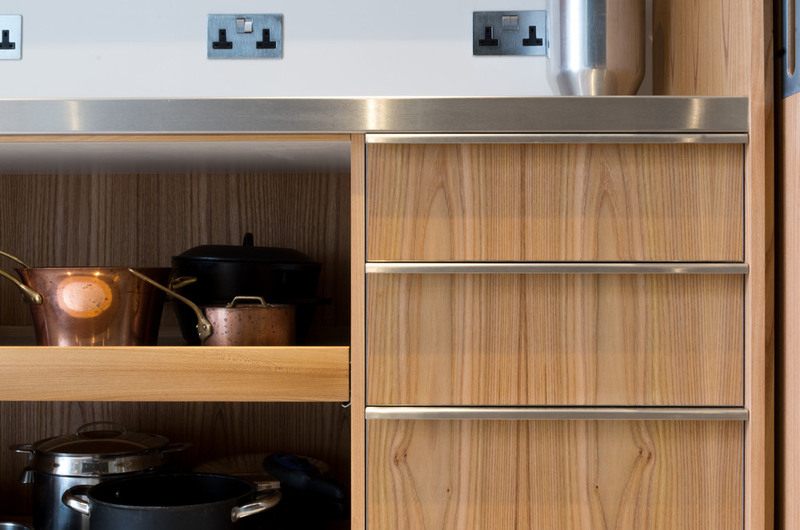 Opposite the pantry sits a workhorse Mercury range cooker with stainless steel worktops either side. Here we incorporated an integrated dishwasher and multiple drawers for storage and easy access whilst a beautiful piece of marble on the rear wall provides contrast to the cold steel of the work surfaces. 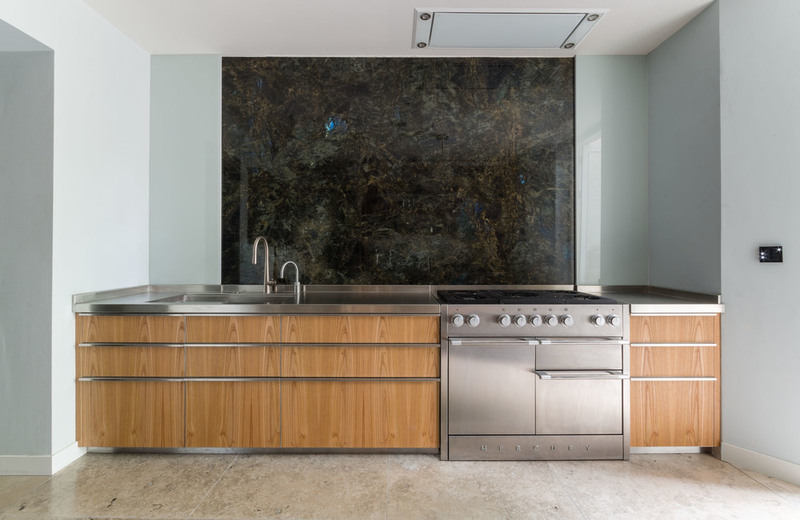 This kitchen was constructed using custom grain matched elm veneered fronts, with custom made stainless steel edging and custom formed stainless steel finger pulls. 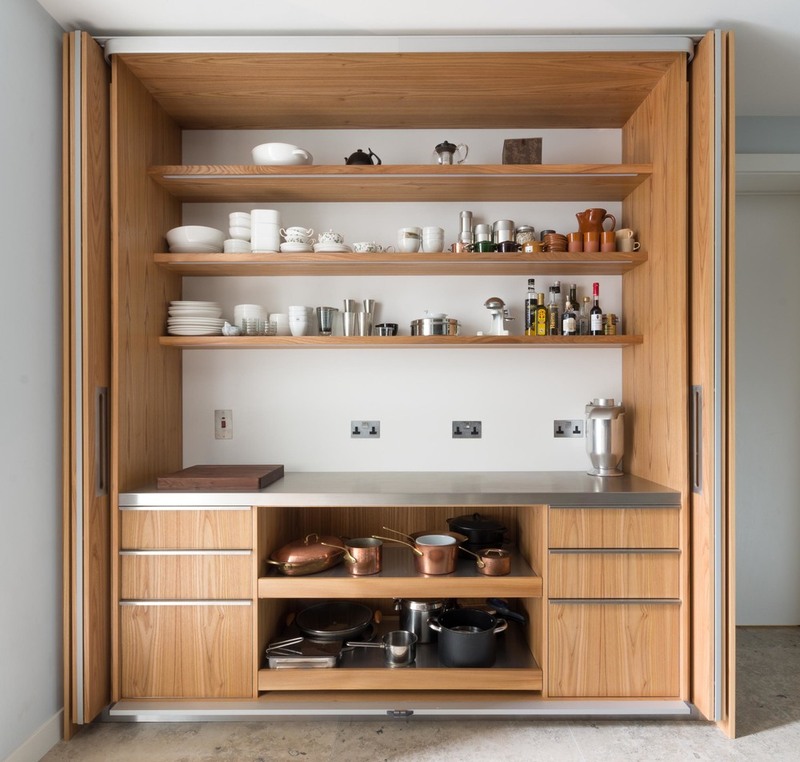 The pantry unit features large stainless clad pull out shelves to store heavy appliances and pots and pans, fixed elm shelving with integrated LED lighting and a white HiMacs back panel. 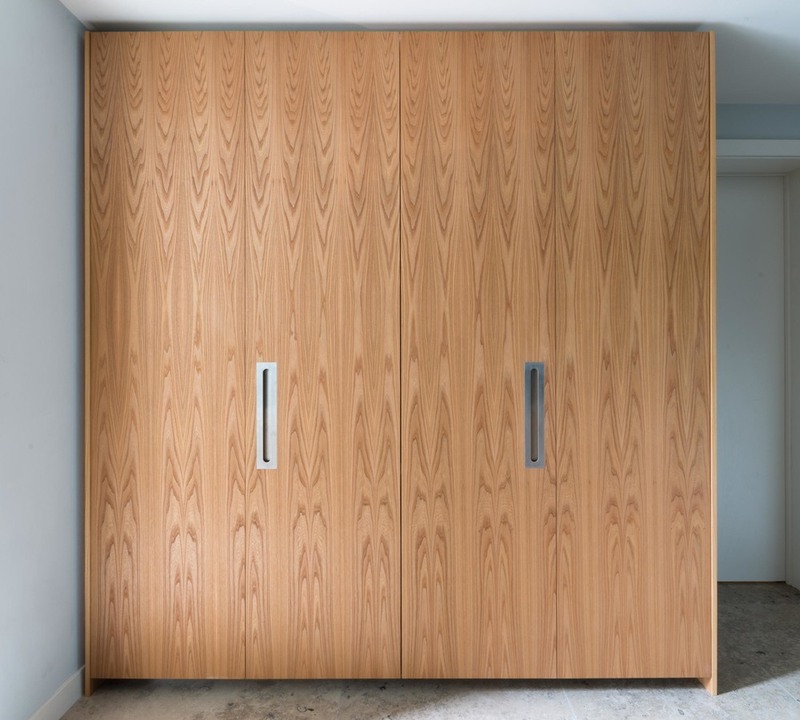 All of this is enclosed by a set of grain matched custom elm veneered doors with bespoke stainless steel pulls which fold and slide effortlessly into their pockets on the highest quality Hawa door hardware from Switzerland.